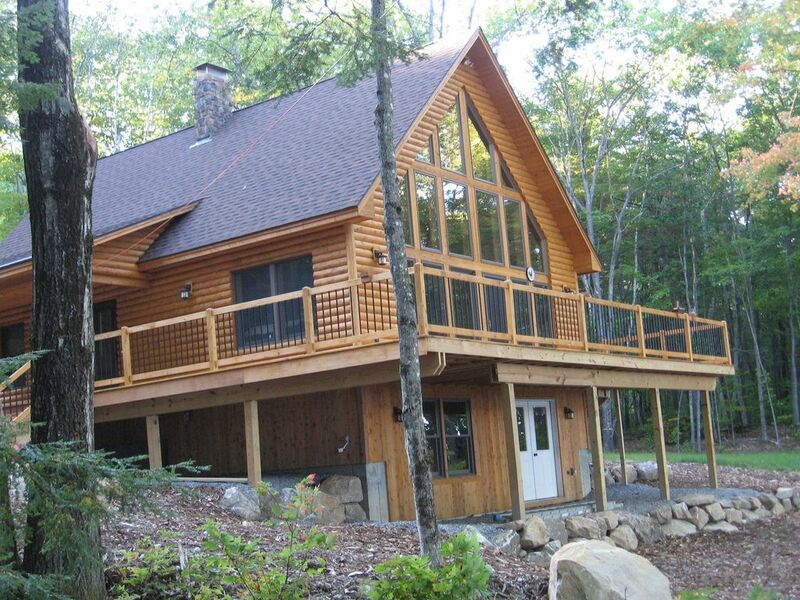 2009 built log cabin with gorgeous water views from home and expansive deck! A large dock system with float dock makes fishing and water access easy. Responsible renters only please. Feel free to contact the owner for other DATES that are not listed as open as owner's family use of the cabin is flexible at times. This home is located on a wooded lot yet is only minutes from Bridgton center for movies, dining, and shopping. (Also 15 minutes to Shawnee Peak and less than an hour to Sunday River in the winter!) Also, enjoy shopping in nearby North Conway or visit LL Bean and other shops in Freeport. The cabin is located on a wooded lot with 200' of waterfront on the western shore of Woods Pond. There is a great fishing right off the end of the dock. Woods Pond is approximately 2 miles long and 1/2 mile across and is one of the cleanest lakes in the area. It is a large enough lake for water sports but does not get heavy boat traffic. 4 kayaks, stand up paddle board, row boat, fire pit, board games and assorted DVD videos. Water access from the dock. There is no beach. However there is a nice town beach about a mile away on Woods Pond with a nice playground. There is a boat ramp on the lake but there are no marina/gas facilities on the lake. Guests are welcome to bring their own boat and tie up to our dock. The cabin has WiFi and cable TV. In addition to the listed 3 bedrooms, the lower level has a comfortable pull-out queen sofa bed with the 1/2 bath and outside entrance which can be nice private space. The loft also has a futon which could be used in a pinch for sleeping. Linens are included. Gary & Donna Schuyler We were married in 1975 and spent our Honeymoon on Squam Lake where we developed a love of the peace and serenity of northern New England lakes. After vacationing for many years on a nearby lake in Maine with our 2 boys we finally realized our dream in 2009 and built this lovely vacation home on Woods Pond. Although our family still gathers here for memorable holidays and vacations it is not used full time and we have now decided to make it available to others. The cabin is located on a wooded lot with 200' of waterfront on the western shore of Woods Pond. There is a great fishing right off the end of the dock. Woods Pond is 2 miles long & 1/2 mile wide. 1 window air conditioner available. Note: rarely needed. TV #1 - Basic cable/satellite for regular viewing plus Roku for video streaming using your accounts. TV #2 - Amazon Firestick for video streaming using your accounts. Such an incredible cozy, but spacious cabin. Our family of five enjoyed a five day stay at the cabin over February Break. Only a 15 minute drive to Shawnee Peak, we were able to spend the day skiing and then head back to a warm and welcoming "home away from home". The cabin was well- appointed and had everything we needed from linens to appliances to cookware. Plenty of wood for the very efficient wood stove. Lots of room to spread-out for family fun or alone time. Tons of snow, but owners made sure that driveway was plowed which made our trek to and from the mountain very easy. With a full moon at night and bright sunshine most mornings the views were amazing! Owners were extremely helpful and very responsive before and during our stay. Thanks for your kind words. We are glad that you and your family had a great vacation and nice time at our cabin. We would welcome you back! We had a great time. Very nice comfortable cabin in a beautiful and peaceful spot, and we loved enjoying the waterfront, the kayaks and paddle board, nearby Bridgton with all it has to offer, hiking at Shawnee Peak, and renting a boat on Long Lake. This beautiful log home was just perfect for our family of 7 adults and 2 small children. The owners have made the home a safe place to bring small children with child gates for the stairs, TV anchored to the wall and the outside deck with locking gates and reinforced railings so your little ones can run around and we adults can be worry free. There are kayaks, canoes and a paddle board for your use, along with life jackets. There is also a fire pit by the water, a place my husband spent many hours. The swimming area off the dock is great with two sets of steps leading into the water so there is easy access for adults and children. There are benches and a chair on the dock to sit and enjoy a quiet cup of coffee and watch the sun rise or set! There is even a solar lamp on the dock to help with some night fishing adventures. The water is clean and refreshing. Down the road there is a beach area that is also available for use. Very well kept and sandy. Our grandkids loved it. The home itself is immaculately kept with comfy beds and an overall welcoming feeling the minute you walk in the door. My most favorite thing about this log home is the set of windows in the main living area which allows the brilliance of the morning sun to shine in. It is a great way to start the day! The town of Bridgton is a quaint town with many small shops, antique shops and eateries. There is a Tea House (need to make reservations), a Bavarian chocolate shop, Bear Bones Brewery pub and a new mexican restaurant. Of course there is Reny's - can't go to Bridgton without stopping at Reny's!! This property is truly outstanding, you won't want to leave. For my family it is definitely a little piece of heaven!! We are so glad your family enjoyed our cabin. We also love the "quaint" town of Bridgton and our guests always seem to make a trip to Reny's one of their must stops when visiting. My family of 5 loved our stay in Bridgton. Beautiful house on the water, lots of kayaks to enjoy and a perfect cabin in the woods. Fishing was fun (2 poles), kitchen was perfectly stocked. Store and town are conveinent and adorable. Area is gorgeous, green and quiet. Owners are conscientious and responsive, couldn't be nicer or more helpful. They made sure we could find everything in the house and it was clean and neat. We made lots of memories there as a family and I would highly recommend this property. We are so glad you had a great time making memories at Woods Pond. Thank you for being such wonderful guests! We are a family of 4 and have just had a great time staying in the Schuyler Cabin on Woods Pond in Bridgton. The property in clean and modern with all the facilities you would expect, and in a very peaceful location. The decking area was great for just sitting and viewing the lake through the trees, or reading if that is your thing, the dock is another great place to just sit and relax. My children spent hours on the lake using the Paddle board and the Kayaks, the lake itself was quiet with the odd speed boat and a few other kayaks. The small town of Bridgton is only a short drive away and has everything you need with restaurants, a supermarket and a great little traditional movie theatre. We would certainly recommend this as a place to stay if you were looking for a quiet relaxing holiday in a super home. We are so glad you enjoyed your stay and wish you and your family all the best with your travel. Bridgton is centrally located near the base of the White Mountain Range in the south west part of Maine. It is approx. 35 miles west of Portand and 20 miles east of North Conway, NH on Rt 302. Visit Mount Washington, Story Land, Santa's Village, Attitash Alpine slides and the Outlet Shopping in North Conway, NH or Portlands coast and enjoy its many wonderful restaurants. Also the Fryeburg Fair in October! No need to leave Bridgton at all for it has plenty of things to do right in town. Enjoy a wonderful Cafe', indoor cinema, drive-in theatre, skiing and hiking at Shawnee Peak Mountain, nature trails, two ice arenas, Bridgton Country Club for golf, snowmobile trails, unique shopping, public beaches and boat launches. Everything is there for you to include a pharmacy, restaurants, library, fish market, butcher shop, book store, tackle shop, movie rental, canoe and kayak rentals and bicycle routes. Highland Lake offers swimming, boating, fishing, , cros country skiing and relaxation. It's a peaceful lake with little boat traffic. Not far away enjoy canoeing on the Saco River, sea plane rides in Naples or shows at the Deertrees Theratre.